by Paul D. Younan — Chicago, Illinois USA. I would like to thank the Assyrian American National Federation, the technical advisors of the Assyrian Internet Group--as well as the Internet Conference--for inviting me to give this presentation to the 68th Annual Assyrian National Convention. I would also like to thank the people who have been instrumental in helping me to bring attention to the plight of our language, and especially to the team at www.atour.com for providing the technical expertise and the web space for many important projects. My gratitude also goes out to Dr. George Kiraz of Beth Mardutho – the Syriac Institute, for his help and work on beneficial projects for peshitta.org. In addition, I welcome all of you to today’s conference and thank you all for this opportunity to discuss a topic near to my heart – the preservation of our beloved Aramaic language. I was truly looking forward to being present at the conference, and would have loved to meet all of you in person. Unfortunately, my mother has fallen ill and is in critical condition in the hospital. For this reason, I am grateful that I have this opportunity to speak with you via the Internet - so that I may remain close to my family here in Chicago at this time. We are grateful to everyone who has written and who has prayed for her speedy recovery. In this presentation, I hope to outline a viable strategy to help the Assyrian Community utilize Internet technologies to preserve and advance our unique Aramaic linguistic heritage. But first let me tell you a little bit about myself. My name is Paul Younan. I’m an Assyrian and translator of the Aramaic Bible on www.peshitta.org - a website dedicated to the collection, preservation and dissemination of religious materials in the Aramaic language. For both nations and individuals, memory is an integral part of existence. As heirs to one of the oldest continuous civilizations in history, the memory of the Assyrian people is of vital importance to world culture. This memory manifests itself in three ways: in preserving our unique cultural identity, in the linking of our past and present, and, finally, in shaping our future. Furthermore, the documentary heritage that is in museums and library archives constitutes a major part of that memory and reflects the diverse phases of our collective history as a nation. But, unfortunately, that memory is fragile. So, in an effort to begin to turn the tide back, I have created peshitta.org. It’s mission, which is simple in concept but massive in scope, is to foster awareness and appreciation of the Aramaic linguistic heritage of the Assyrians, and to serve as a scholarly resource for research through the collection, preservation and dissemination of religious materials relating to the Assyrian Christian identity. To begin with, the introduction of print and radio in the late 19th and early 20th centuries, has had profound effects on our tightly-knit and largely closed communities. It is in these small pockets of our ancient culture where these new media were, and where they have also continued to be vital tools in creating a sense of national identity. Radio and print media also played another equally vital role by serving as a means of preserving and advancing our unique linguistic heritage. Now, as we enter the twenty-first century, internet technologies present even more opportunities to marginalized and stateless groups like the Assyrians for preservation, advancement, expression, publication and horizontal communication. As scholars and laymen we must work to better understand what this means for all aspects of our culture and ideology. Appealing to a Broader Audience. Cultural identity is made up of a shared history (a memory), common language, common religion, and cultural meanings. It also consists of behavioral patterns that express who and what a cultural/social group is, what they have been through and where they see themselves in the future. As Assyrians, our cultural identity is extraordinarily unique and therefore it is hard to find common ground with other ethnic groups. The Aramaic language has survived among our people through the rise and fall of empires, plagues, Hellenization, Arabization, Turkification and Kurdification. It stands today as one of the most significant traits that distinguish us from our neighbors. But that has not always been the case. Although the ancient Assyrians are credited with the spread and standardization of the Aramaic language throughout the Near East - many different peoples have used Aramaic during various epochs. Thanks to our ancestors, Aramaic was the very first "lingua-franca." It also has served as a basis for almost every Western-based alphabet in existence, from Greek to English and from Hebrew to Arabic, as well as various Asian scripts used in India and Mongolia. And finally, Aramaic was the language of Jesus Christ and His Apostles, and the language in which the message of Christianity was first preached. This makes the Aramaic language an important topic of study for all Christians. Western Christianity has historically ignored this important field of study, but now, thankfully, that is all beginning to change. As for ourselves, one of the ways we can bring attention to our plight as a people is to educate the world on the significant impact of the Aramaic language. This precious heritage which we share, has reached far beyond the borders of our homelands and had a tremendous impact upon the West’s own religious, cultural and historical perspectives. Therefore, by broadcasting our appeal to the world using the global medium that is the Internet, our achievements will be twofold. We not only raise awareness and appreciation of our linguistic heritage within our own community, but we also elicit direct help from individuals and organizations from outside of our community in preserving this unique treasure. The concept of ‘Information Technology’ was, of course, practically coined by our ancient Assyrian ancestors. From Medicine to Astronomy, from Religion to History, the ancient clay tablets of the library of Ashurbanipal bear witness to the incredible achievements of our forefathers. This is what is known as the first Golden Age of Assyrian linguistics. Throughout the ages, and continuing after the fall of both Nineveh and subsequently of Babylon, Assyrian scribes never wavered in their ability to play a major educational role in the emerging Persian and Greek civilizations. However, after the advent of Christianity, the linguistic traditions were maintained in a different form under the bishops and metropolitans who were in charge of schools within their jurisdiction. Thus, the famous schools of Edessa, Jundishapur, Merv and Nisibin formed important centers of linguistic, medical, mathematical and philosophical work. These traditions even remained intact after the conquests of Islam under the Arab Caliphate, where Assyrian scribes and doctors of renown preserved some of the most important works of medicine and philosophy. It is therefore with great pride that we now look at this time frame as being the second Golden Age of Assyrian linguistics since it witnessed the immense growth of the Assyrian Churches - as far as Japan and to the islands of the Pacific. With this phenomenal growth, the alphabet of the Assyrians formed the basis for many of Asia’s modern scripts, including the Uighur, Mongolian and many Indian scripts. In modern times, our people are well aware of the plight as Arabization and Westernization begin to take their toll on our language and our culture. I believe that by using the Internet technologies available to us, we can begin to awaken our people to the need of preserving our language and provide a means to passing this knowledge on to future generations. With the World Wide Web, this can be accomplished on a global scale with unprecedented ease. The Aramaic language and script were used as a lingua franca over all of the Middle East. Documents and inscriptions in the Aramaic alphabet have been found from Greece to Mongolia, and the oldest inscription in Aramaic script yet discovered dates from approximately 850 BC. Aramaic literature encompasses a treasure of nearly 3,000 years of Assyrian civilization, including our versions of the Bible (the Peshitta), hymns and poems, translations of Greek works, biblical commentaries, historical works, laws, compilations of the lives of saints, and works about philosophy, grammar, medicine, and science. Modern Eastern Aramaic has sixteen dialects, spoken by Christians and Jews, and a widely spoken western dialect. Modern Western Aramaic is spoken in three small villages north of Damascus, but in a very mixed form with words borrowed from Arabic and Turkish. The Aramaic Background of the New Testament. "Many of our Assyrian people in America unfortunately are unaware of the key which we hold to the Scriptures, and especially to the New Testament, through the Aramaic language, the language which our Lord Jesus Christ spoke and preached during His mission on Earth." Mar Eshai Shimun, Patriarch of the Assyrian Church of the East. New Testament textual criticism has generated much interest in the Aramaic language, especially over the last hundred years. The question concerning the original language of the New Testament is hotly debated, but the fact that the Christian message was first preached in the Aramaic language is something that is now universally accepted. Therefore, the attention of the Christian world is now directed more and more to research in the Aramaic and Semitic linguistic background of the New Testament. Whether or not one believes the words of Mar Shimun, or in an Aramaic origin for the New Testament, is inconsequential. What is important is that the eyes of the world are now upon the last remaining pockets of Aramaic speakers. With this newfound attention, we can help to bring the plight of our people to the forefront. We can generate the interest and support to help the few remaining places in the world where native speakers reside. With this support, a major portion of our heritage as a people can be protected and nurtured. At www.peshitta.org, we feel this worldwide attention now being targeted at the Aramaic language presents a unique opportunity to help us as Assyrians preserve our language and to use the Internet as a global medium to teach our future generations. The Successful Resurrection of Hebrew. The Hebrew language is often named as a language that has been successfully revived. Other examples of success stories are the Maori language of New Zealand and the language of the native Mohawk Nation of Quebec. Like the Assyrians, the Jewish people went through centuries of being suppressed in their religion and culture while being scattered throughout the world, and like the Assyrians, they were victims of repeated genocide and holocaust. In 1948, the State of Israel was created in their homeland in the Middle East. By this time, the speaking of Hebrew had been kept alive, often in secret, in religious ceremonies. Much of it, however, also like the Aramaic language of the Assyrians, was confined to religious texts and liturgical settings. However, reviving the speaking of Hebrew in a secular setting, and among the general population, was a daunting task. Jewish people who moved to Israel after the establishment of the State of Israel were from many different linguistic backgrounds-- such as Russian, English, French and German --and they needed a common language to communicate in. This is fast becoming the case with Assyrians today, who are scattered throughout the world and especially in the West, where Aramaic has become a second language, if spoken at all, to the majority of the descendants of those first immigrants from Beth-Nahrin. A symbolic function of Hebrew was that it was an emblem of common nationhood, common religion and common destiny. A nation-state with autonomy over educational, political and social institutions enabled the quick comeback of Hebrew, which was enforced as the national language in all public institutions after 1948. By 1961, Hebrew was identified as the primary or only language of 75% of the population of Israel. Some practical strategies for its revival included: (i) Berlitz type teaching in schools, and in evening and weekend classes; (ii) establishment of Hebrew speaking societies, where people gathered to practice speaking the language; (iii) the coining of new words and terms to modernize the language; and (iv) developing official terminology through the Hebrew Academy. Without a state of our own, the prospects of preserving our own language in the Diaspora are overwhelmingly difficult. But the Internet, coupled with a viable strategy, can help us overcome these difficulties in spite of being without a nation of our own. In order to avert language death and language shift, internationally renowned language planner Joshua Fishman proposes eight stages in Language Planning which, if carried out successfully, can bring the use of a language back. We can adapt these eight stages, in concert with an Internet effort, to the revival of the Aramaic language in the homeland and throughout the Diaspora. Stage 8 involves the reconstruction of the language. Especially for languages that are not well documented, this means the recording and compiling of as much knowledge of the language from elders/fluent speakers as is possible, before it becomes impossible to collect such information. Reconstruction can involve the recording and compiling of vocabulary and expressions in dictionaries. It includes the recording, analysis and presenting of stories and legends, of life histories, of songs, proverbs, and all other kinds of knowledge of the language in taped and written form. It must also involve the documentation of the sound system (phonology) and grammar of the language. Documenting and reconstructing the sound system, grammar and a many-thousand word vocabulary of a language is a difficult task, which usually requires someone who is trained in linguistics, and it involves many thousands of hours of work. Fortunately, the Aramaic language is rich in textual witnesses such as the Peshitta bible and the works of the Church Fathers, and also in numerous Grammars and Lexicons - like those of Yukhanan bar-Zubi and Bar-Hebreaus. These linguistic materials, collected and preserved on the Internet, will become invaluable resources for curriculum to teach younger people the language. In the case of Aramaic, a vast amount of such materials already exist in public and private collections. Here, it is a matter of cataloguing and duplicating the materials, storing them safely, and editing or preparing them so they are usable. This is where support for projects such as Beth Mardutho’s eBethArké is essential, and why we at www.peshitta.org fully support this very important endeavor. A note must be said here on the dialectic differences in the various Assyrian communities. Since all of the various modern dialects employed by the Assyrian communities of the different religious sects, and even within the same religious sects, derive from the ancient (Classical) Eastern Aramaic dialect of Edessa, we believe it would be best to standardize the future written and spoken language based on this common ancient dialect. Stage 7 is the mobilization of elderly speakers who still speak the language well. This stage involves recruiting these elders to speak the language with younger people, their children and grandchildren, which is much easier said than done. It also includes recruiting elders to teach the language in formal settings, and providing them with the skills to do so. Many elders who speak their language would like to learn to read and write it and mobilization can involve teaching literacy to elders. Their knowledge can be captured by Assyrian web sites, and organized into a more structured system of education in a type of "virtual" classroom setting. Stage 6 is the promotion of the use of the language in the family, the neighborhood, the community and electronic media. If this promotion is successful and translates into families, individuals, parents, grandparents and children increasingly using the language in everyday life and on public occasions, Stage 6 can restore and continue the pattern of intergenerational transmission of the language. This stage is the most crucial of all. As Fishman notes, "If this stage is not satisfied, all else can amount to little more than biding time." Internet sites can provide for the means and location for a dispersed community, like the Assyrians, to congregate and use the language in a global setting. It then becomes imperative that projects to standardize proper Aramaic HTML fonts and right-to-left word computing are supported. Stage 5 involves integrating the language into a formal education system. This stage this can be accomplished through evening classes, Sunday school, and Internet language programs like the one produced by my friend and colleague Mr. Alan Aldawood at www.assyrianlanguage.com, as well as the Grammar Section of www.peshitta.org. To a large extent and because of the historic difficulty in the public school setting, churches and monasteries have been primarily involved in teaching our children their language in the homeland as well as in the Diaspora. But, especially for areas in the Diaspora where this may not be feasible, the Internet can become an invaluable tool in successfully implementing Stage 5. Fishman calls stages 8 through 5 the "weak side" of language revival. They do not primarily rely on financial resources, but on the sweat and toil of community members. Stage 4 involves the replacement of the dominant language by the Aramaic language in formal education. This means immersion programs, at least at the earlier levels of schooling, and bilingual or partial immersion programs at the higher levels of schooling. In recent times, the schools that are being built in the homeland and in the Diaspora, have given us hope in attaining this goal. But again, especially within the areas of the Diaspora where our population and our resources are limited, this type of traditional schooling may not always be feasible. This is where Internet instruction can be instrumental in helping to bridge the gap of knowledge for these isolated and dispersed communities. Stage 3 involves the integration of the language into the workplace. It requires considerable corpus planning, including literacy, translation of documents, mobilization of speakers to use it in the workplace, and the creation of opportunities and occasions for integrating the language into the workplace. This stage is typically more feasible in areas of self-rule, but nonetheless similar results can be achieved in areas of the Diaspora where the concentration of Assyrians is large enough to implement this strategy. Using the Internet within the scope of Assyrian e-commerce and political presence can partially realize the goals of stage 3. Stage 2 involves integrating the language into the domain of what Fishman calls "lower government services that are in direct contact with citizens." For Assyrians, the various agencies in question would be regional governments in the homeland and political organizations in the Diaspora. The Internet can, again, be crucial in implementing this stage through various communicative protocols, including, but not limited to, election proceedings and political communication. Stage 1, according to Fishman, involves the implementation of the use of the language at the "upper reaches of education, media and government operations." Use of the language in the "upper reaches of education" would involve its use as a language of instruction (rather than as a language which students learn as a subject) in Assyrian Post-secondary institutions. However, the latter requires careful planning, because there may be dialect differences between communities, or because there exists more than one writing system (orthography) for the language. This stage is reliant upon a proper and universally accepted standardization method in Stage 8. Stage 1, then, requires the establishment of a Central Language Authority that is, a body which plans and oversees such things as writing systems, adaptation of new terms, deciding which grammatical forms and pronunciation are considered correct and appropriate by speakers of the language, among other things. It is absolutely essential that such a central governing body represent all of our diverse communities and dialects, and also pays close attention to the standardization of our language based on the dialect which we all have in common – the ancient Eastern Aramaic dialect of Edessa. Fishman's Stage 1 also invokes the role of media in language revival. This could involve broadcasts in the Aramaic language through radio and television, the publication of newsletters, newspapers and magazines, and communication through the Internet. To a small extent, this is already being accomplished through Assyrian web sites like aina.org and Zinda Magazine. But much more will need to be done to incorporate the newly standardized language, alongside with English, to realize this goal. For linguistic preservation, this type of global medium can be extremely helpful. 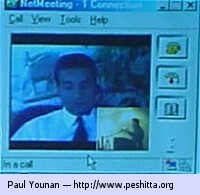 For example, a teacher who is well versed in the Aramaic language and who lives in Holland can easily teach Assyrian students, without a local teacher, in a small community in Germany or Russia utilizing technologies such as Video Conferencing or Live Audio - the very same technology that is allowing me to give this presentation to you from Chicago. Support for Stage 8 – Archival Projects. While many of the stages in the Language Planning Strategy are already at least partially implemented, unless there is more attention paid to standardization and development of a common dialect based on the ancient Aramaic language, these efforts may be in vain. Unity can only be achieved by supporting a strategy that incorporates the common threads between all of our communities. This means that the most proper vehicle of communication between our communities must be the ancient Aramaic language – something we all have in common. For these reasons, it is imperative to support and fully implement the goals of Stage 8 – Reconstruction and Archival of our available resources, before it’s too late. We at peshitta.org fully support and wish to participate in such projects as the Syriac Digital Library of Beth Mardutho, and the Comprehensive Aramaic Lexicon of the Hebrew Union College. Through these projects, the materials necessary for such a reconstruction become widely available to both scholar and layman, to those within our own community and to everyone in the world. Bringing the Aramaic Lexicon to the Web. Another project in which we have corroborated with existing Assyrian groups is the Aramaic Lexicon and Concordance to the Aramaic New Testament, now freely available over the Internet at peshitta.org. This Lexicon contains thousands of Aramaic words, their English meaning, and even their pronunciation - all within a click of a mouse, to all of our communities, worldwide. Much work went into making the texts available in a web page, and we utilized the past work of groups such as the Way International Research Team and Beth Mardutho. With help from the talented staff at atour.com, we were finally able to put this treasure online. Aramaic Grammars on the Web. The team at peshitta.org has been creating an Aramaic Grammar, and will also be working with others like Mr. Alan Aldawood in the near future, to create Grammars of the Aramaic language based on historical works by grammarians such as Yukhanan bar-Zubi and Bar-Hebreaus. We are also researching ways in which we can effectively begin real-time instruction in our language utilizing streaming video, audio, and other technologies. This can be a tremendous achievement for Language Planning, especially for a nation that is as widely dispersed as the Assyrians. A dynamic and vital Assyrian community engages in its self-renewal by participating in and providing for a wide range of high-quality Assyrian learning opportunities. Our various Assyrian communities are diverse and dispersed, and their educational needs can best be met by a global strategy. That strategy can incorporate components of Language Planning, utilizing the Internet as a global Medium, to ensure that our heritage survives for many more millennia. People who have studied the contact of various languages, and the phenomena of language shift and language death, have come to paint a bleak picture of the chances of survival of minority languages like Aramaic in the contemporary world. However, we can learn from past mistakes and misguided strategies. To ensure success, Assyrian organizations must work together to implement every stage of the Language Planning model before it’s too late. And the Internet can be a vital tool in this strategy. Those of us who have this knowledge must continue to provide instruction, on the web, to our future generations. There are some potential roadblocks. The use of and access to the Internet is mostly the privilege of relatively elite groups of middle and upper class peoples in wealthy areas of the world. Public Internet access projects and participatory communication policies, especially in the areas of our homeland and Diaspora where financial resources are limited, must be implemented if the preservation and advancement potential of network use is to be realized. It is imperative that our cultural and political organizations appreciate the greater possibilities of Internet use for cultural reproduction and other empowerment processes. With the proper implementation of these strategies, I believe our chances for success are great – until that time when the Universities of Nineveh and Nisibin can, once again, bring light to the world and glory to our civilization.